Elizabeth A. 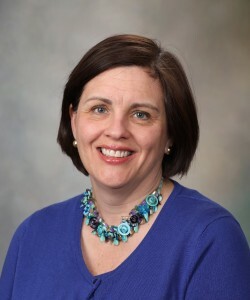 (Ebbie) Stewart, M.D. is a professor of obstetrics and gynecology and chair of the Division of Reproductive Endocrinology at Mayo Clinic in Rochester, Minnesota. Her work centers on uterine fibroids, the leading cause of hysterectomy and a disease with a substantial increased incidence and severity in women of African descent. Dr. Stewart founded the first Comprehensive Fibroid Center at Harvard Medical School (Brigham and Women’s Hospital) and currently practices and conducts clinical and translational research. She has authored many scientific publications on basic and clinical research and the book Uterine Fibroids: The Complete Guide. Dr. Stewart has received research funding from the National Institutes of Health (NIH) and numerous industry sources. She is currently conducting the FIRSTT study (NCT00995878, clinicaltrials.gov), an NIH-funded, randomized clinical trial of minimally invasive treatment options for women with fibroids. Dr. Stewart is a noted speaker on the topic of fibroids, lecturing both nationally and internationally. Key Words: uterine fibroids; leiomyomas; hysterectomy; alternatives to hysterectomy; health disparities; African American women.